Purchase signed copies through the Starsys Publishing store on Square by following the link below. Purchase directly from Starsys Publishing Company from this page. You'll have the opportunity to provide special instructions during checkout. Purchase the Kindle Edition or another format from Amazon.com by following the link below. Signed copies are not available through Amazon.com. 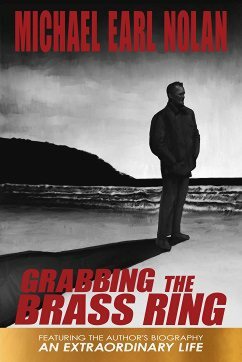 Grabbing the Brass Ring is an epic Homeric tale of a complex and enigmatic man, Richard Mansan - a front-line fighter, an adventurer, and a natural leader. In a time close to ours...on a world not unlike our own...Mansan is either blessed or cursed with the ability to clearly see the inevitable consequences of mankind's actions, choices, and huberis - a vision shared by no one else. As a result of serendipity or design, he finds himself inextricably entwined with the major leaders of the day. Yet, despite the benefit of his friendship and counsel, as well as their own valiant efforts, they are unable to stem the tide of events as the world catapults madly to an unavoidable fate. A story of power, war, greed, ignorance, pride, and redemption, Grabbing the Brass Ring will give the reader a glimpse at the worst...and the best within all of us. An Extraordinary Life: The Biography of Michael Earl Nolan, the complete biography of the author, is featured at the conclusion of his novel. After a phenomenal career as a legendary football player, record-setting track and field star, powerhouse wrestler and weightlifter, and multi-titled heavy-weight boxing champion - Michael Earl Nolan joined the U.S. Marine Corps in 1941. He fought at Guadalcanal, Bougainville with the famed Raiders, and Iwo Jima, rising from private to captain during the war, and retiring a major. With an amazing life that spanned hopping freight trains in the 1930s to becoming the highly respected civil engineer responsible for the massive Coronado National Forest, Nolan was a fascinating individual, a sensitive and prophetic novelist, a devoted family man and friend. To this day, he remains an inspiration, a real-life hero in every sense of the word.